Hot Head, Simon Ings, Grafton, 1992, ISBN 9780586214961, 272pp. Simon sent me this, his first novel, over six months ago. My taking so long to get to is should be no reflection on the work, which is quite good, but just my general slowdown. 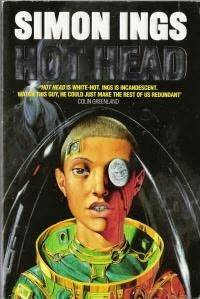 Hot Head is post-cyberpunk fiction, like Neil Stephenson’s Snow Crash. Both novels deal in themes raised by William Gibson, et al., but in here Simon takes the mileu and stretches it out onto a third world political canvas while Stephenson poked at it with the satire stick. The novel sputters a bit in the front as Simon info dumps the background of his protagonist, Malise. But as he warms up to his subject, and as the novel moves into the “present” line of the story rather than Malise’s past, Simon hits stride. Many writers have toyed with the human/software implant (best done in George Alec Effinger’s When Gravity Fails, I feel), but Simon’s able to make it new here. Possibly it’s because he realizes that it (the technology) is not the story (even though the novel is named after it), but a part of the story. This novel could as easily have been titled Moonwolf (but, then, that sounds slightly like a horror or fantasy novel, doesn’t it?). I was thrown off a bit by the sudden impact of the ending, but I think that was due more to my start-n-stop reading method than any fault of Simon’s. Which I can’t place, but it’s somewhere in United States Live (“Walk the Dog”?). Given this novel, and the fact that he quotes Laurie Anderson, how can I help but look for Simon’s next?